Startups are built by the hour. So how do you decide what needs to be done now? Starting a new company in a brand new industry is hard. You are inventing something that the world has never seen before. It’s not like opening a restaurant or a dry cleaner where you can follow best practices, plagiarize ideas from successful competitors, or talk with others that have done it before. It’s all new. How do you manage that newness? How do you decide what needs to be done today when you sit down at your desk? There are a million different possibilities and you know that the “still around in five years” statistic for startups is grim, and especially scary when it involves innovation. You also know that you don’t have a boss or professor watching you so you could spend the day on frivolous activities or checking your email over and over throughout the day. Nobody will know except for you… at least for now. I handle this problem with dozens of strategies which I’ll write about later, but my favorite is to set public goals. Putting a date out there for the world to see creates a form of commitment that is partly inspiring and partly panic inducing in those moments when you are laying in bed inside your thoughts. Making your goals public means that the quiet failures that we all endure suddenly become a source of potential shame instead something you can justify and explain away to yourself. Now you are answerable to somebody… everybody. This is especially true when you have a goal that you don’t have to accomplish. If you are can’t pay your rent, you are pretty much forced to get a job so you can have a place to live. But those last 20 pounds? Maybe you’ll just not wear your swimsuit in public this summer. Learning guitar? You can always do it later. Your future self is always ready to be loaded up with difficult goals, even though today you are too tired to do anything but try to hit level 34 on Candy Crush. It’s also easy to set public goals that can be easily accomplished or easy to lie about. You set a goal to start saving for retirement? Well, if you save one dollar, you officially saved something for retirement and when somebody asks you how you are doing, you won’t be lying when you say you are doing it. But set a goal to have a million dollar net worth by age 30 and it’s a little harder to lie when you are still managing that Taco Bell. So today I’m setting a public goal. To move our company forward, we need to first build a usable prototype of our VR/resistance/workout/game system. What does that mean exactly? Good question. How do I define the goal for our team without making it too difficult, too set in stone and hard to change (especially as we plan to iterate and learn as we go), or too easy to lie to ourselves about accomplishing? Well, if we create a crappy prototype that allows us to “run in place” in VR, well, I guess that is a workout and if we add a timer then it is kind of a game. Right? Let’s celebrate and have a party! We are amazing innovators! Obviously, this would be a false victory and we wouldn’t be much closer to accomplishing our larger mission. It’s easy for us to be lazy and not reap the rewards of a public commitment. This sounds like a better idea because it forces us to do our research, create a detailed plan to execute from, and gets us all on the same page. If one of the specifications is that we must create a pneumatic resistance system that has a minimum force of 100 pounds and a resolution of 0.1 pounds per 100 ms, integrated with the Unity game engine using a specific type of code and plugin, well, that doesn’t give us any room to learn or iterate. What if it becomes obvious in the next few weeks that this system won’t work and we have to go back to the drawing board? We can either move forward with the wrong product, or change it and miss our public commitment. Hmm… that doesn’t work. I’ve had a gym membership since I mowed lawns to pay for it when I was 14 years old. Quit the gym? Never lift traditional weights again? This is a super scary thought for somebody who thinks of himself as the type of person that lifts. I can’t stand the idea of not being healthy and fit. Will I get flabby and weak? How will I look and feel? With this type of goal, every decision we make toward our prototype will have to move us toward our ultimate company mission of replacing the traditional, outdated gym environment with something that works better, is more likely to create consistency, and is an enjoyable, addictive experience. We can build based on our current ideas or completely change based on what we learn, but the end result is the same. You know what? Now that I think about it, I need to end this blog post right here. Time is ticking. Share your ideas and thoughts in the comments below. Nice commitment to what you’re doing. Love your use of the word iterate. Excited to see what the next 156 days plus a few hours holds for you. 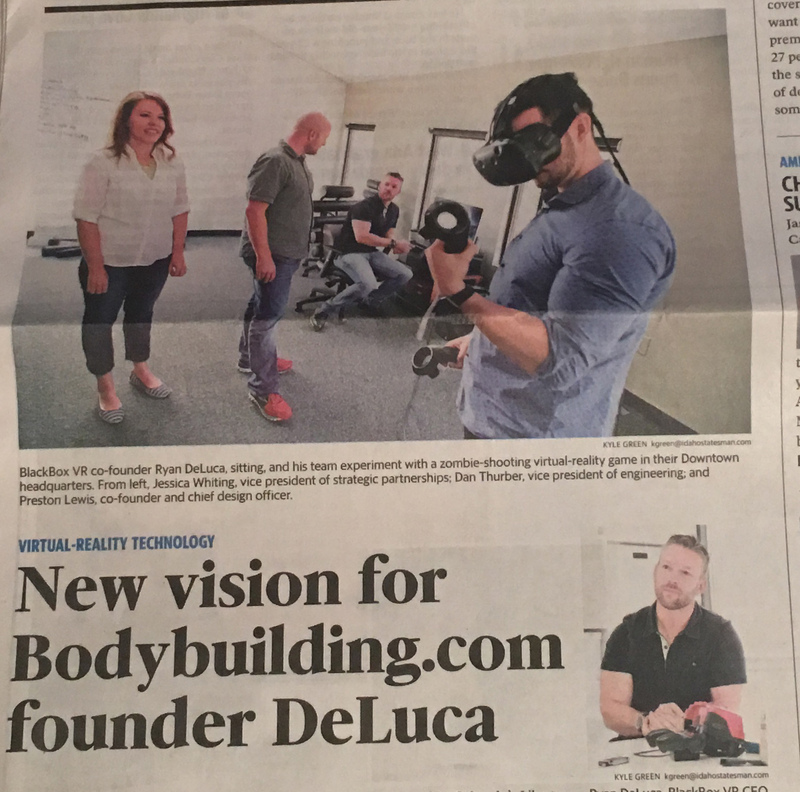 Where will the first Black Box VR gym be located? Interested in this. As a gym owner and box owner I agree with the term “outdated.” I will be following this progression. Best of luck. I love that you make things personal. It’s not about putting the goal out there that only somewhat affects you if it isn’t met. You are developing a new product, technology, and business and making the goal about your personal need. Raising a company with the mindset of how can I help others (and yourself), looking from the inside out versus taking the “how can I make money off this” mindset proves you know how to do this. And you will succeed because of it. Willing to help in any way I can.